This Company Layoff Notice Form is included in editable Word format that can be customized in Word or by using the included Wizard software. To: First Last, Contract Job Title. Re: Notice of Indefinite Layoff. This notice is to inform you that due to a insert reason here - such as "seasonal slowdown," "lack of work," "lack of funding," reorganization, etc., you will be laid off effective Start Date. Enclosed you will find information that includes details about the support services available to you, as well as other information that you may find useful regarding the impacts of layoff. If you did not receive this packet of information, or if you have additional questions, you may contact Human Resources Name in the Company Human Resources Department at Human Resources Phone. The Human Resources Department is also available to discuss any additional benefits, such as unemployment, training, and other benefits you may be entitled to because of this layoff. You may be eligible to continue Company-sponsored health, vision, or dental coverage via the COBRA insurance continuation program. For more information regarding COBRA and how to continue these benefits, please contact Human Resources Name in the Company Human Resources Department at Human Resources Phone. The Human Resources Department is also able to answer any other questions you may have concerning all Company policies, benefits, and other employment issues. 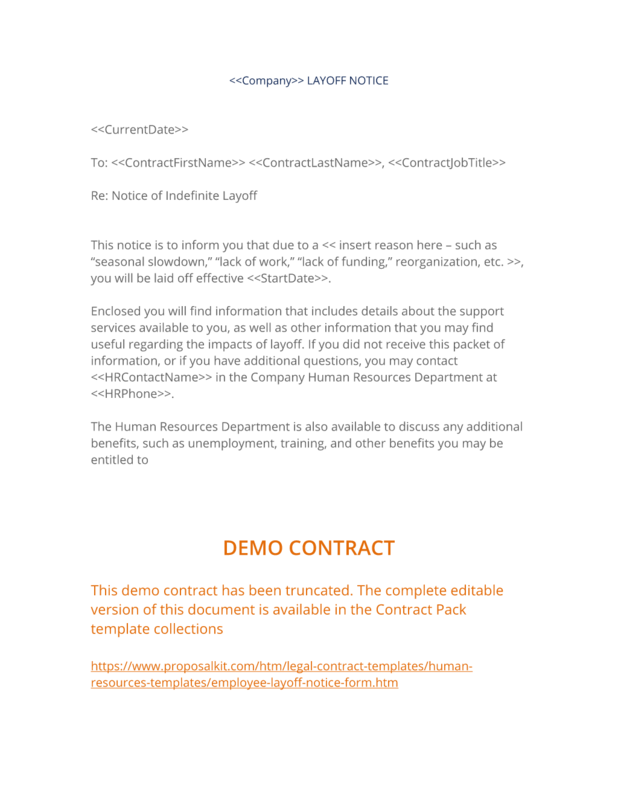 The complete Company Layoff Notice Form - with the actual formatting and layout - is available in this Contract Pack.